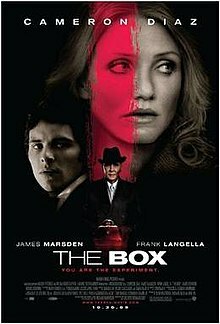 If watching The Box (2009) makes you think of the television series The Twilight Zone, you’re not out of line. The screenplay, which was written, directed, and produced by Richard Kelly, was based on Richard Matheson‘s Button Button — and a 1970 episode of The Twilight Zone. Cameron Diaz and James Marsden are Norma and Arthur Lewis who are struggling financially. After receiving devastating news that impacts their already difficult situation, a box mysteriously appears at their door. Its secret provides the answer they’ve been waiting for but it comes with an impossible price. Frank Langella is Arlington Steward and the mysterious man behind the box. He is ominous and ruthless. Once the decision is made, there is no backing out. This science fiction drama gets five stars out of five. This entry was posted in Cameron Diaz, Drama, James Marsden, movie review, movies, mystery suspense, psychological drama, psychological thriller, Richard Kelly, science fiction, suspense thriller and tagged Button Button, Cameron Diaz, debbie elicksen, drama, Frank Langella, James Marsden, jennifer miller-bender, movie review, movies, our movie talk, Richard Kelly, Richard Matheson, science fiction, suspense, The Box, Twilight Zone by admin. Bookmark the permalink.